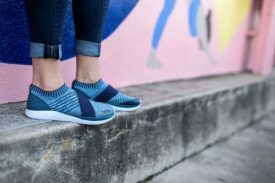 (Logan, UT – March 18, 2019) The Altra Dyani is a women’s-only slip-on made for your busy lifestyle; convenient, comfortable and cute. This shoe has a trendy look that pairs well with jeans, leggings or sundresses and is ideal for after the gym, running errands or everyday wear. The Dyani features a plush and springy EGO™ midsole coupled with a sock-like custom knit upper that gives ultimate comfort with a fashionable flair. The Dyani has a 20 mm stack height and weighs just 6.7 ounces. Three colorways make this shoe versatile: heathery black, light blue/navy or coral. Retail price is $100. The Dyani is also made with Altra’s Fit4Her™ technology, meaning every women’s shoe is customized to the unique anatomy of the female foot. Women have a narrower heel and midfoot, a higher instep, a longer arch and unique metatarsal spacing which is accounted for on every Altra female shoe. The Dyani is available on www.AltraRunning.com and at your local specialty running retailer. @AltraRunning and #ZeroLimits on Twitter, Instagram and Facebook.